This week at ITPL, the American history podcast, we take on the last third of the 19th century, a period known as both Reconstruction and the Gilded Age. As many of you know, the Gilded Age is the period of US history that I specialize in. I know I’m biased, but to me, this is the most fascinating and compelling period in US history. It’s when the United States leaves behind the agrarian republic envisioned by founders like George Washington and Thomas Jefferson, and plunges headlong into an industrial age that even Alexander Hamilton could not have imagined. It’s a time of incredible wealth production (hence, the Gilded label), as the United States surges to become the world‘s foremost industrial economy.And along with that comes the rise of ghttp://inthepastlane.com/how-to-subscribe-to-the-in-the-past-lane-podcast-and-why/reat cities like New York and Chicago, and unprecedented immigration from Europe and Asia. It’s also an exciting age of revolutionary new technology. The railroad spreads across the continent, along with the Internet of the day, the telegraph. Electricity and electric lights begin to transform every day life. And yet, despite all this exciting progress, the last third of the 19th century was a deeply unsettling time. The rise of big business alarmed many Americans, because industrialists like John D Rockefeller and Andrew Carnegie acquired stupendous wealth – and with that wealth came extraordinary power. They could use that power to compel Congress or state legislatures to do their will. And they could force their workers to accept long hours, low pay, and dangerous conditions. And if those workers went on strike? Industrialists could count on the local police, state militia, or even federal troops, to crush it. And there were a lot of strikes in this area – 37,000 between 1880 and 1900. And some of them – like the Great Uprising railroad strike of 1877 – were huge and resulted in scores of people killed. And in between strikes, the evidence of rising levels of poverty and unrest was everywhere. The situation out in the heartland was just as fraught. American farmers struggled against the usual things like drought and locusts, but also predatory banks and railroads. So as urban workers join unions like the Knights of Labor, farmers joined Farmers Alliances that demanded the government regulate banks and railroads. Both movements represented popular resistance to an economy and political system that they believed had become rigged in favor of the rich and powerful. It would eventually lead to the rise of the Populists and the People’s Party insurgency of the 1890s. And there was great turmoil and violence elsewhere, in the American south and west. In the south, the first decade after the Civil War saw African-Americans gain full citizenship and civil rights. And they used these rights to build new lives as free people and to exert political power. But by the mid-1870s white southerners rose up to overthrow Reconstruction and impose white supremacy, establishing a racist and oppressive social order known as Jim Crow. And in the west, the US Army launched the final, bloody campaign to defeat Native Americans and forcibly remove them to reservations. I think you’ll agree, there’s a LOT happening in the Gilded Age and Reconstruction, that last third of the 19th century. In many ways, it’s the period when modern America takes form. And because this transformation marked a new era in US history, it raised compelling and troubling questions about democracy, equality, and citizenship. 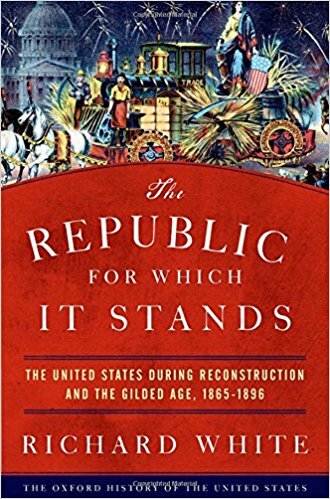 To explore these questions and the answers and how Americans in the late 19th century struggled to answer them, I speak with historian Richard White, author of a new book on the period, The Republic for Which It Stands: The United States during Reconstruction and the Gilded Age, 1865-1896. How Reconstruction and the Gilded Age are inextricably linked. The Republican Party’s post-Civil War vision of eliminating regional differences and creating a unified, homogeneous republic. How and why the Republican Party initially fought during Reconstruction to create a multiracial republic based on equal citizenship but then allowed white supremacists to overthrow it. How Buffalo Bill created the popular (and convenient) narrative of westward expansion and Manifest Destiny. Why resistance to the onset of wage labor explains so much of the civil unrest in the Gilded Age. Why most Americans in the Gilded Age feared the rich and worried that plutocracy and inequality would destroy the republic. How “cooperation” (and socialism) emerged as a unifying ideal in the Gilded Age among those who feared the rise of inequality and corporate power. Why all three major political parties (Republican, Democratic, and Populist) by 1896 agreed that the challenges posed by industrialization and big business required a stronger federal government. What Americans living in the second Gilded Age can learn from the first Gilded Age.